Upping the ante in the crowded compact sedan category, Tata Motors on Wednesday launched Tata Tigor, its third product in the tax-efficient sub-four metre sedan segment. The biggest selling point for Tigor is its aggressive pricing. At Rs 4.7 lakh for the base petrol variant, Tigor is now the cheapest compact sedan in the country and even undercuts Tata’s existing models. For example, the largest-selling car in the segment - Swift Dzire - starts at Rs 5.27 lakh, while the base petrol version of Indigo CS, from the Tata stable, is priced at Rs 5.03 lakh. 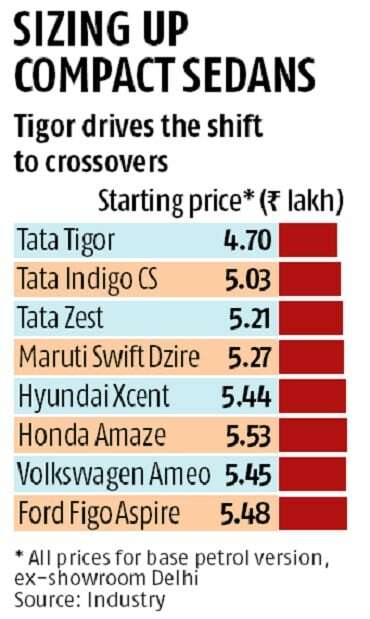 Besides Indigo CS, Tata Motors also sells the Zest in the segment, but has not been able to break the dominance of Maruti Suzuki’s Swift Dzire in the category. The compact sedan and hatchback category, accounted for over 40% of car sales in January 2017, at over 114,000 units. Maruti accounted for 56,000 cars in the category, with Swift Dzire selling over 18,000 units in January 2017. The Tata Tigor 1.2-litre petrol model comes in four variants in the price range of Rs 4.7 lakh to Rs 6.19 lakh, while the 1.05-litre diesel engine mounted models starts at Rs 5.6 lakh and goes up to Rs 7.09 lakh in Delhi. The Tigor is the second all-new launch by Tata Motors in 2017 after the sports utility vehicle Hexa in January, which, the company claims, has notched over 2,000 retail deliveries. Launched in April last year, Tiago sold close to 60,000 units and has helped the company pull buyers back to its showroom. Tiago, which, too, was a price warrior like Tigor, was the first successful launch by Tata Motors after a series of lacklustre product launches. The company is now trying to build on Tiago’s success by launching a new series of stylish products to attract young buyers and expand its sales and service network. “With Tiago, Tigor and Hexa, we now cover 51% of the addressable market. But I have 49% of the market unaddressed. But I am very sure we have made the right beginning with these models and are very much on track,” Mayank Pareek, president-passenger vehicles, Tata Motors, said after the launch. Tata Motors is positioning Tigor as a stylish hatchback rather than a sub-four metre sedan for price-conscious carbuyers. 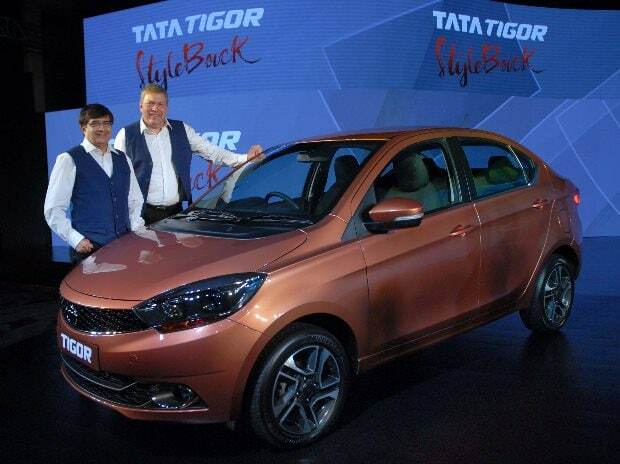 Calling it ‘Styleback’, Guenter Butschek, chief executive officer and managing director, Tata Motors, said Tigor was “our redefinition of the compact sedan category”. There is excise duty rebate for sub-four metre cars, making it a popular category for customers looking for economical sedans. Some industry experts find the pricing on the higher side, given the current pricing of the Tiago hatchback. “Given that the two cars are nearly the same in most respects, Tata Motors is asking for a premium of nearly Rs 1 lakh for additional boot space and few additional equipment. Besides, most of the additional features and conveniences are only available in the higher variants, robbing Tigor’s price advantage,” said an auto analyst. Others, however, say it would expand Tata’s presence in the sub-compact segment by inducing potential Tiago customers to upgrade to a bigger car by spending 20-25% more. The stock market was indifferent to the new launch, with the stock down 0.7% in the trade on Wednesday. Analysts attribute this to the small share of domestic passenger car division in the company’s consolidated revenues and profits. The Jaguar Land Rover division accounts for nearly two-thirds of its revenues and 90% of its consolidated net profits. Tigor is based on the Tata Tiago hatchback platform but gets a sporty and coupe-like design that gives it an edge in the boot-capacity, compared to the peers in the category. Other than the longer wheelbase and a few bells and whistles, the car is largely based on Tiago, including engines, interior colour scheme and overall styling.